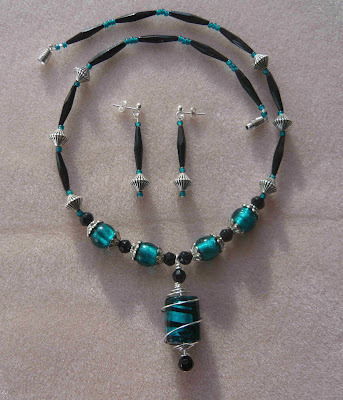 Blue foil-lined and black beads with silver spacers. The pendant was made by pushing a large bead into one of those ready-made bead cages that looked much too small. The stretched effect of the wire made it look like wire-wrapping. This was demonstrated to me by the lady who owns the woolshop in Clay Cross, so the credit for the clever idea must go to her, not me. Oh I love this, truly gorgeous!